Starting a career in the food service industry at the young age of 15, Abby’s journey began at a hole in the wall restaurant in Missouri. Working in every position from dishwasher to manager in the years to follow, she learned to appreciate and love every aspect of the restaurant industry. 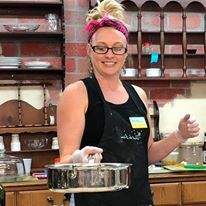 Regarding education in the culinary field, Abby began her first years of school at Johnson and Wales University in Denver, CO. From there she transferred to The Art Institutes International in Kansas City and completed her degree in 2014. Abby’s love for the culinary field came out of a necessity for a job at a young age. Her parents gave her the option to be in the school play or get a job. That led to a serving position and eventually, after working in the culinary field since, an understanding of the industry. Although all of her family’s functions had relatively well cooked food, she took a nutrition class at the age of 17 and realized that the food she was consuming was not benefiting her health as much as it could. Thus sparking her interest to learn as much as she could about the nutritional aspects of food. With a passion for creativity and a need feed, Dent de Lion Custom Catering was started in 2015. The main focus being to bring fresh, seasonal and nutritional food to every event that Dent de Lion has the pleasure of catering. As an added benefit, having a customizable menu allows for the creative process to be engaged, as well as all dietary needs to be met. The goal of Dent de Lion is to provide a unique and personalized experience for every event.